For the past few months, I've been running backtest experiments where I compare publicly available strategies against each other. I have been documenting results in my Medium series - https://medium.com/@deandree. I just thought I share this here, because I believe my results and information could be useful to Gekko community. Also I hope to hear insights and comments from you. In my next article, I have planned to dig deeper and show you the price prediction line of each strategy, so we can get a better understanding of what's really going on behind the scenes. Let me know if this is useful to you and/or if any suggestions! Thanks! Yes, starting time is very important. I've seen quite huge (x2/x3) difference on 10m candles, on 120/240/etc it could be much higher. Due to already long time it takes to run my tests for each Medium part, I have not included multiple starting time in my tests. If I wanted to do that, I could try a few offsets (like for 240m candles take 0h 1h 2h 3h offset) and calculate average. If people want to see that, I can make special article about that. Let me know if this works for you and if any suggestions for future topics. Thanks! For me that image in your OP isn't loading. @askmike thanks, I fixed the image in first post. This time, instead of single month, I go full year. Backtesting 32 strats in total. Also I take a review of market overall in 2018, highs and lows. 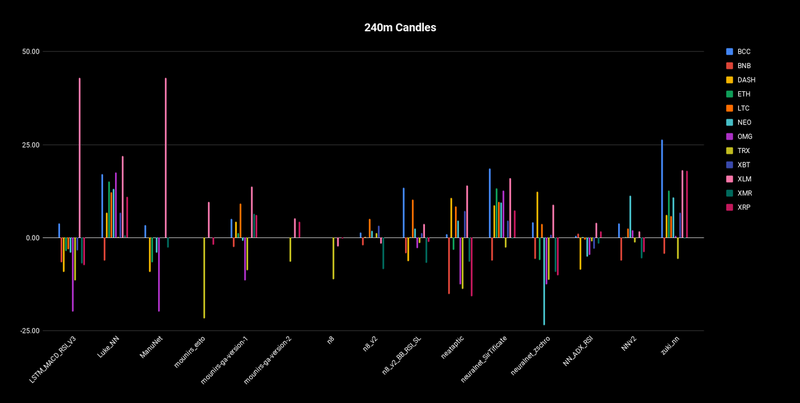 For example, here is chart that shows each coin profits/losses in % (market value) throughout the year, month by month. Bars represent percent change from months first date to last. 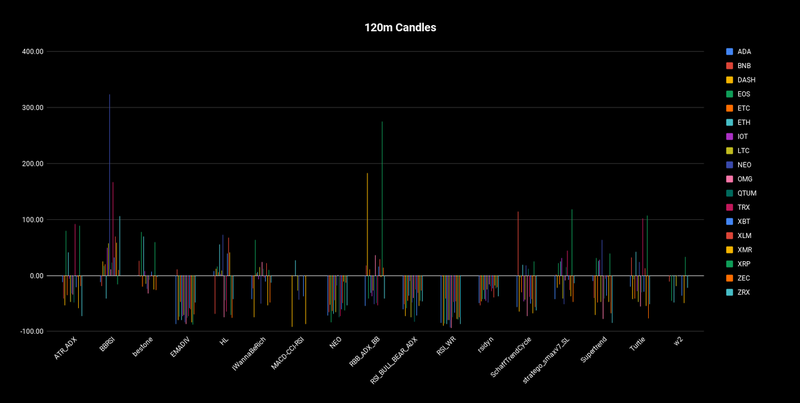 And here is Advanced strats in 120m candles. Sorry, I broke the link accidentally (it changed), thanks for letting me know. EDIT: looks like there was some temporary mixup or redirect issue on Medium side while moving post to publication. All the links mentioned above should work now.